Everyone is "crazy" about the lady bug drum! Even some of the parents have come on the campus and played it. Our students, ages 3 to 8, are really enjoying playing it. They have started using a chart of letter names to play "Merrily We Roll Along." Some figured it out right away so I've made them a new chart. Should take a little more time to learn "Old MacDonald." The principal is so happy with it and constantly telling me how much they love it. It's great that the kids are getting some music experience along with playground time. On behalf of my school, Bayless Elementary, in Lubbock, TX, thanks to the crew for the great job installing the playground equipment. The crew worked in a timely manner and always checked with me to make sure it was to our satisfaction. There were many days with extremely cold winds and frigid temperature that the men were out working to get this playground set up. The supervisor was very professional and approachable. We are very appreciative of their diligent and careful work under the circumstances they worked under. They had a great work ethic and were always receptive and positive. Thanks for sending such a hard working crew! Now that the playground is completed, I am hearing many fine comments about it. 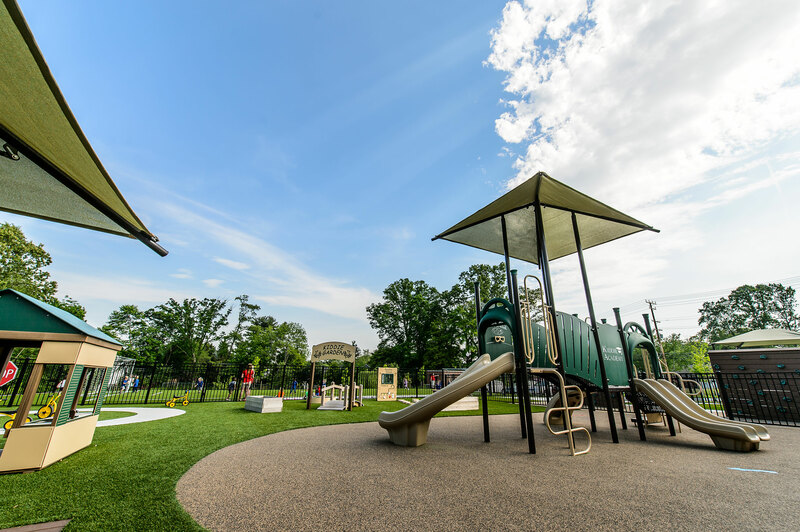 Several of my professional colleagues at the University of the Incarnate Word has been to see the playground and have given rave reviews of the site. I plan to showcase the playground as part of several courses and conferences in the near future. My students, especially the all level physical education majors, were extremely excited about what they saw and experienced when I had our class tour the facility shortly after it was finished. I believe this playground to represent a model for what is best for play environments for all children and is an outstanding example of how play environments can be designed for the physically and mentally challenged of multiple generations. The play value of the many varied pieces of equipment will serve Mission Road for many years to come. In addition, this play environment will help teach others about the importance of play and play environments. Thank you for making this all possible. I am very pleased with the service we received from Grounds For Play, and very happy with the playground equipment. We've had so many "Wow's!" when people come and tour our facility, and our playground is one of the reasons why! I will recommend Grounds For Play to anyone wanting to install a first-rate playground. The Meyer Center for Special Children is a non-profit developmental preschool for children with disabilities. We are located in Greenville, South Carolina, and have operated for 55 years. While at the Center, our children receive intensive physical, occupational, and speech therapies during their school day, along with a preschool program that meets their individual needs. The children are diagnosed with cerebral palsy, Down Syndrome, other syndromes and developmental delays. We serve approximately 170 children each year. We recently built two new playgrounds – one for our younger children (up to age 3) and one for the older children (ages 4-7). All of the equipment for these areas was purchased from Grounds For Play. I can’t say enough about the tremendous help and great service provided by Grounds For Play! We told the sales representative what we needed and were given sound advice and counsel on what would work well for our children. Today, we have a beautiful playground that meets all of our needs. Our swing set is equipped with appropriate swings, including a wheelchair swing. The fire truck is wheelchair accessible, and all of the pieces of equipment provide many opportunities for all of our children. We constantly give tours of our Center, and I love taking people out on the playgrounds – they truly have a “WOW” factor!!! The children especially love the train and the fire truck, and the parents are thrilled to have such beautiful areas for their children to enjoy. We’ve actually had several parents ask if they could use the playgrounds for private events. I have also been contacted by other daycare facilities asking to come and look at the playgrounds. I highly recommend this company! Working with them was definitely a blessing to me and the Meyer Center. As you can see by the attached photos, the new playground is a great success! 150 satisfied preschoolers are endorsement enough, but 40 happy teachers constitute some serious proof! The comment that I hear over and over is "It has such a good flow!" Some of that is obviously due to the improved trike path; that loop was number one on the staff wish list! For me, the biggest differences is the sense of spaciousness, which you created with the placement of the new climbing structure, as much as moving back the fence a few feet. Most of all, the design really shows consideration of the setting and optimizes the natural elements. One of the children expressed it well when seeing the renovation for the first time: "We don't have a playground anymore - now we have a park!" It has been a pleasure seeing the design come to life -- watching the children engaged in play, enjoying the variety of activities available. We appreciate the consideration given by Grounds For Play to the specific needs of our program, our population, and our facility. This playground is a great example of the difference that makes! Thanks for helping us build a great place for children to play and learn. I just wanted to thank you once again for making sure we were satisfied with our Grounds For Play purchases. The Marimba sounds wonderful and is being enjoyed by the children, which when played is enjoyed by the adults too. The playground bounds with joyful sounds between the marimba, the drums, and the other equipment we got from you. The play structure is wonderful and we are so grateful to you for your wonderful design. Mike Vestergaard and his colleagues installed it in one day and were professional, polite, and helpful. Today, they brought the additional 8 cubic yards of mulch so the structure is complete. It is so aesthetically pleasing and the children love it. They go down the double slide on the middle hump, pull each other up the slide with long hoses, jump off, climb up, and play underneath! Thank you so much. Thanks again for all you do! You've done more than just help Colleen and I build a playground, you've helped us build a life experience. You've been a wonderful coach and a guide. The thing that makes this playground so unique and special is you. You are the important "x" factor in the combination. You specifically put with us, because God knew we needed much more than someone helping us pick out playground equipment. We needed everything that you have brought to this experience through your thoughts, knowledge, experience, encouragement, steady support, positive energy, and heart—none of this can or could be duplicated or provided by anyone else. I look to you as more than just a representative—I look to you as a friend and leader to help us over this mountain that we so innocently took on. Thank you for taking the time to listen to me yesterday. In these final days of completing the playground, you have given me a vision of what to expect, and the knowledge and hope that we can finish this! I’ve heard of horror stories from other directors that have installed playgrounds, but my experience could not have been any better. I will HIGHLY recommend Grounds For Play to anyone that might be considering a new playground. Keep up the great work at Grounds For Play! You’re doing a terrific job! !